One on one personal training is specifically designed to meet your needs. Using tried and true methods of strength training and conditioning we help you reach your goals whether it is to lose weight, gain muscle, or become a better athlete! Call to Schedule! 630-335-1748 | Check Out Our 5 Star Reviews on Google! Group personal training is recommended for the client who wants to bring in a friend, sibling, parent, or spouse to push with them through a motivating workout. Groups can be up to five people and are advised to be near the same fitness level for optimal training! "This client lost over 15LBS and 5% body fat with consistent training under the one on one sessions!" 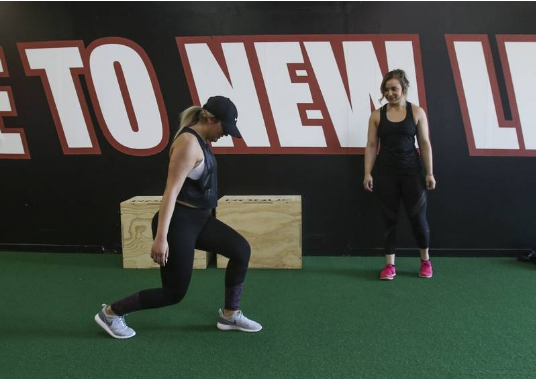 "One of our trainers Jackie putting her client through an intense lower body workout!" "Both clients agree these are some of the hardest training sessions they've ever had in their competitive football and soccer careers"